Director/Screenplay – Paul King, Story – Hamish MacColl & Paul King, Based on the Books by Michael Bond, Producer – David Heyman, Photography – Erik Wilson, Music – Nick Urata, Visual Effects Supervisor – Andy Kind, Animation Director – Pablo Grillo, Visual Effects – Framestore (Supervisor – Christian Kaestner), Murky, Nvizible (Supervisor – Matt Kazmir) & One of Us (Supervisor – Dominic Parker), Special Effects Supervisor – Mark Holt, Creature Effects – Nick Dudman, Production Design – Gary Williamson. Production Company – Heyday Films/Studio Canal/Anton Capital Entertainment/Canal+/Cine+/TF1. An explorer comes across a species of intelligent bears in Darkest Peru. He teaches them to speak English, all about London and introduces them to the joys of marmalade. He departs, inviting them to come and stay with him in London any time. Some years later, after the bears’ home is accidentally destroyed, one young bear sets out on a journey with a suitcase of marmalade to find London and take up the explorer’s offer. Stowing away aboard a ship, he eventually arrives at Paddington Station and sits about wondering how to find the explorer. He is found by insurance adjuster Henry Brown, his wife Mary and their two children Judy and Jonathan. Henry reluctantly agrees to let the bear, whom Mary names Paddington after the station, to come and stay for one night until they can find it a home. In the house, Paddington proceeds to cause chaos with his innocent misunderstanding of human ways. They set about trying to track down the explorer. Meanwhile, Millicent, a taxidermist from the Natural History Museum, learns of Paddington and becomes determined to capture him so that she can stuff him as part of her collection. Paddington Bear is a much-loved children’s creation – this author has distant childhood memories of having the stories read to him at a young age. Paddington was the creation of Michael Bond, a former soldier in the British Army who was working as a cameraman for the BBC at the time and had published some plays and stories. Bond’s inspiration came about after he brought a stuffed bear for his wife at a train station. The image of the lone bear sitting on the shelf stuck with Bond and he quickly developed it into a book of stories, which he published as A Bear Called Paddington (1958). This was a success and Bond published a further twenty-eight books about the small unassuming bear and the Brown family up until his death in 2017. Paddington had been adapted to the small screen three times before with Paddington (1975-86), a part animated, part stop-motion animated tv series; Paddington Bear (1989-90), an animated series from Hanna-Barbera that unforgivably wrote in a bunch of American kids; and the Canadian-produced animated tv series The Adventures of Paddington (1997-2002). There has been much merchandising, including best-selling fluffy toys, even a record where Paddington sings. This live-action film adaptation has been managed by Harry Potter producer David Heyman. In the director’s chair is Paul King, who had previously only made one film with the little-seen Bunny and the Bull (2009) but was almost certainly chosen for the role because of his directing of all the episodes of the cult comedy series The Mighty Boosh (2003-7). Ever since Babe (1995) gave us the idea of a standard Disney-type talking animals film conducted in live-action, we have seen a number of classic stories featuring animal characters incarnated in live-action with the likes of 101 Dalmatians (1996), Dr Dolittle (1998), Stuart Little (1999), Garfield (2004), Charlotte’s Web (2006), Alvin and the Chipmunks (2007), Underdog (2007), Yogi Bear (2010), The Jungle Book (2016) and Peter Rabbit (2018). Most of these and other live-action talking animals films such as Racing Stripes (2005), Beverly Hills Chihuahua (2008), G-Force (2009), Hop (2011) and Zookeeper (2011) left one with lowered expectations for Paddington. Most of these reduce the animal characters to an inane series of slapstick antics, contemporary pop culture referents and cynically hip one-liners. One’s prospects for Paddington seemed dim after seeing the trailer, which highlighted the scene with Paddington causing havoc in the bathroom and ick factor gags about using toothbrushes to gouge out earwax. 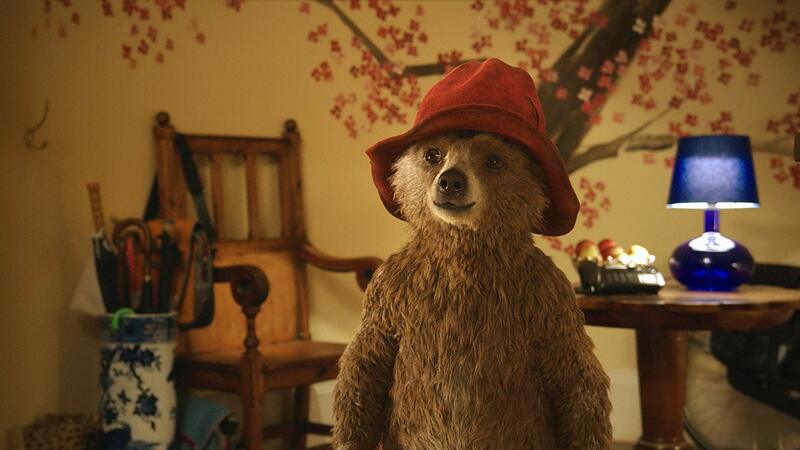 What we seemed in for was less Michael Bond’s Paddington Bear than a reprise of the live-action Yogi Bear. The good news is that this does not turn out to be the case at all and Paddington arrives on screen with considerable charm. The central character is quietly unassuming – little more than a child trying to make sense of a big wide world. Where the film wins its charms has something to do with the nonchalant acceptance of a talking bear by people as the central character where nobody seems to find this at all peculiar. One of the things I did like about the film is that it retains the essential Englishness of the originals without watering it down for American audiences. The world that Paddington inhabits is quintessentially an English one, filled with elevenses, breakfast marmalade, visits to Portobello Road antique stores, black cabs, beefeaters outside Buckingham Palace, bobbies and cups of tea to calm all ills. It is, you suspect, more a hyper-real fantasy of Britishness that was common to the 1960s period of the original stories than today – ie. a father who is an insurance broker living in London being able to afford a live-in housekeeper and a home in upper-market Primrose Hill – but strikes an instantly recognisable chord. The film remains extremely faithful to the details of the original stories – about the only major addition is the character of Nicole Kidman’s one-dimensional villainess who seems to be there to give the story some kind of dramatic foil (which Kidman has a field day playing). Paddington has a number of slapstick sequences – the one with Paddington causing chaos in the bathroom (which is actually a sequence taken from Michael Bond’s first Paddington book), apprehending a pickpocket, becoming caught up in scotch tape as Nicole Kidman attempts to break in to the house. The silliest of these is surely the image of Hugh Bonneville in drag conducting a break-in to the library of the Natural History Museum, ending in Paddington’s sandwich blowing up the entire building. You could compare these sequences to the ones from almost any of the abovementioned live-action talking animals film, which are almost all agonising and unfunny in their loud and overblown slapstick. Paddington does this too, which gives me cause to wonder why it endears and they do the exact opposite. The reason I think has to do with the fact that Paddington respects its material and its audience; these other films seem driven more by a frenetic need to ingratiate themselves with child audiences to the extent that they write the material down to a moronic low and seem to assume loud chaos, cynical one-liners and pop culture nods are what every member of the audiences has come there to see. This does it with charm. Paddington 2 (2017) was a sequel reuniting most of the talents here.